Would you be surprised to learn that the United States has approximately 4.09 million miles of public thoroughfares? What if you learned that over one-third of those — more than 1.4 million miles — were unpaved gravel or dirt roads? It might be hard to believe that the U.S. could have so many miles of unpaved roads in the 21st century, but it is true. The statistic becomes even more inexplicable when you compare the disadvantages of unpaved roads and advantages of asphalt pavement. • Paved roads are safer. Ruts in unpaved roads can wrench control of a vehicle from the driver and cause an accident. Unpaved roads become very slippery in wet weather, which can also lead to accidents. In dry weather, dust from an unpaved road can obscure the driver’s vision, which again poses a risk of accidents. • Cars traveling on unpaved roads stir up a lot of dust that fills the air. This dust can find its way inside nearby homes or businesses, exacerbating existing respiratory problems. • The gravel is not going to remain in place on unpaved roads. It can wash into drainage ditches and reduce their ability to handle run-off efficiently. Sediment washed into the drainage ditches along with the gravel can make the problem worse. • Paved roads make adjacent properties more desirable to employees and customers as well as those seeking to purchase a home. This, in turn, can enhance property values. • If an unpaved road is travelled by more than 100 vehicles per day, it will be substantially more expensive to maintain than a paved road. As the traffic increases, the costs of maintaining an unpaved road rise dramatically. By the time that the road is supporting an average of 250 to 300 vehicles per day, the unpaved road will cost 2.5 to 3 times as much. Installing asphalt pavement is preferable to leaving a road unpaved in virtually all scenarios. Whether you base it on maintenance costs, safety factors or economic impact, it just makes sense. 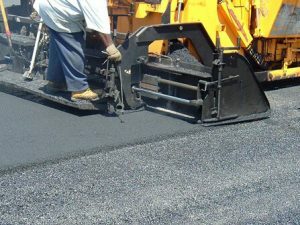 Asphalt Pavement Solutions has more than three decades of industry experience and serves customers throughout New Jersey, Pennsylvania and Delaware. 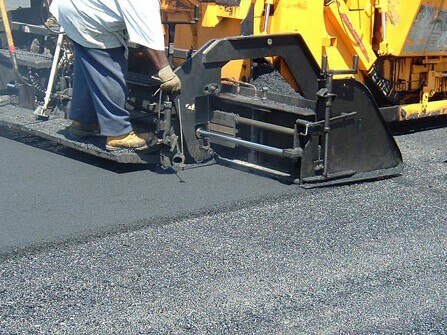 We offer an extensive range of asphalt-related services from asphalt paving to sealcoating. We can apply parking lot markings, car stops, bollards and signage, repair cracks or potholes in your asphalt pavement, or repair the inlets for your storm water drainage system. Our crews are dedicated to providing quality work at reasonable rates. You can request a free estimate by submitting our convenient online form, or you can call us (856) 461-1710 or toll-free at (800) 559-SEAL.